Soak up the sun along our white-sand beaches. Treat yourself to diverse dining, enriching arts and culture, shopping districts of all sorts and natural Florida fun. In Sarasota, each moment is your own. Zota Beach Resort on Longboat Key | Enjoy contemporary cool on Longboat Key at the new Zota Beach Resort, located on the Gulf of Mexico. Longboat's newest luxury beach resort features modern architectural touches along with stylish accommodations. Don't see what you're looking for? Browse more events and festivals. Sarasota's beaches await an hour south of Tampa, and each offers something a little different. The best part? You don't have to choose just one. Seafood shacks on the water, fresh local fare in downtown hot spots, and the annual Savor Sarasota restaurant week – this is dining in Sarasota. Choose from beachfront resorts with a view, stylish boutique hotels, comfortable vacation rentals or peaceful campgrounds. 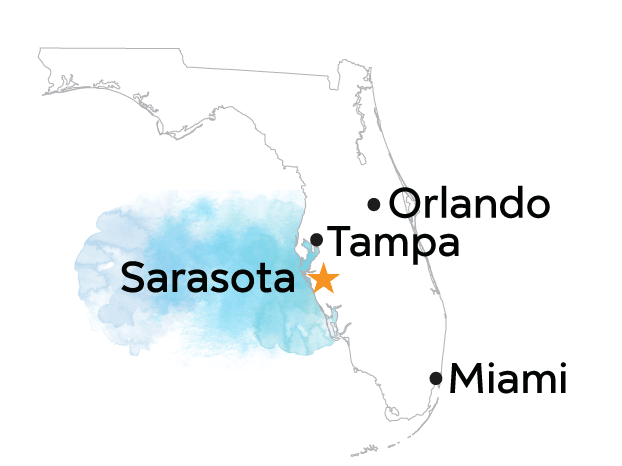 Sarasota is known as the “cultural coast” for good reason. Visit a museum, take in a show, celebrate at a festival, or discover what makes this a circus city. Make room in your bag – shopping in Sarasota means everything from high-end handbags to golden conch shells. What will you bring home? From family-friendly gardens where you can hand-feed flamingos to adventure courses where you can zip-line through the trees, here are some don’t-miss spots in Sarasota. Interested in becoming a VSC Corporate Sponsor? Learn More. 19503 S. West Villages Pkwy.